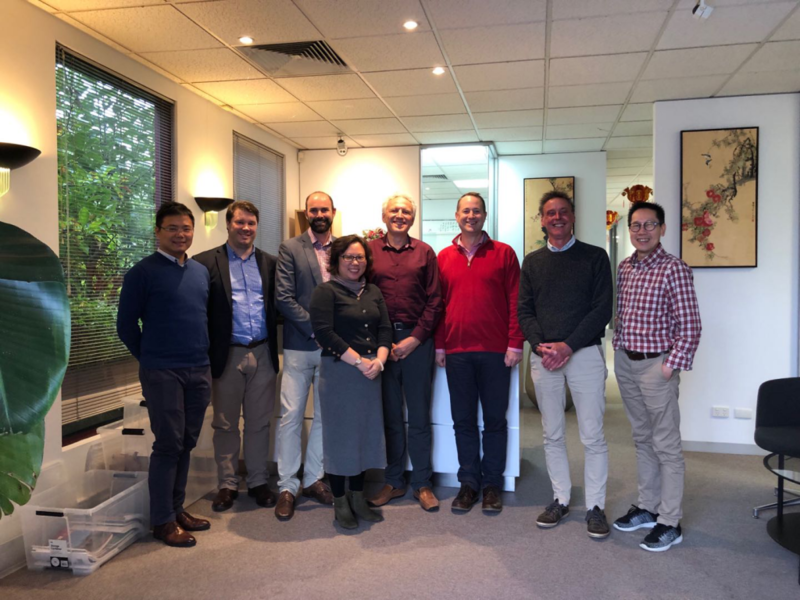 The Steering Committee for the Joint Research Centre in Traditional Chinese Medicine met for the first time on March 31st, 2019 at AEMG’s head office in Melbourne. The Joint Research Centre to initially run for five years was established in December 2018. The Centre is a collaboration between AEMG W&E Health and the University of Tasmania and will focus research on growth and production optimization of traditional Chinese medicinal herbs. The meeting, chaired by Prof Holger Meinke from the University of Tasmania endorsed key priorities and established a Scientific Advisory Group, to be led by Prof. Dugald Close from the University of Tasmania. Legend (from left to right): Dr Jacko Feng, Manager of AEMG Research and Strategy (Secretory); Mr Todd Nation, Commercial Business Partner of TIA (Secretory): Prof Dugald Close, Associate Director of TIA (Steering Group Member); Ms Jenny Wang, Director General of AEMG (Steering Group Member); Prof Holger Meinke, Director of TIA (Steering Group Member); Prof Andrew Roberts, Vice President of AEMG Academy (Steering Group Member); Prof Peter Frappell, Vice President of AEMG Research and Strategy (Observer) and Mr Frederick Tao, Director of AEMG Finance.